Of the offerings made on the Day of Atonement, the most significant was the sin offering. 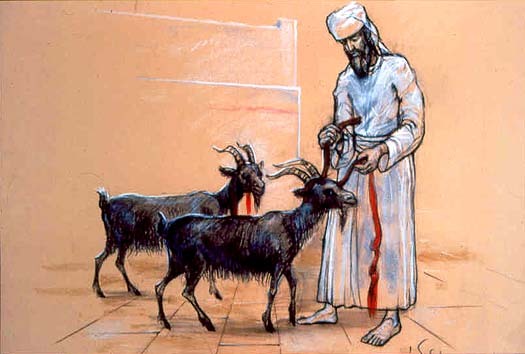 Leviticus 16:5 says the high priest was “to take from the Israelite community two male goats for a sin offering….” Note that both goats constituted a single sin offering. Lots were cast for the goats: “one lot for the LORD and the other for azazel” (Lev. 16:8). The goat for the Lord was slaughtered; with its blood, the high priest entered the Most Holy Place and the presence of God, then sprinkled the blood on the ark (Lev. 16:15). The blood was sprinkled in this way to cleanse Israel from sin (Lev. 16:16). The goat for azazel was presented alive before the Lord. The high priest laid his hands on the goat’s head, confessed all of Israel’s sins, and transferred them to the goat’s head. Bearing all of Israel’s sins on itself, the goat was led into the desert—away from the presence of the Lord—and released (Lev. 16:21, 22). The significance of the goat for azazel isn’t entirely clear. “Azazel” can mean “entire removal” or could be the name of a desert demon. This second goat clearly removed sin from Israel’s camp as the first definition suggests. But if “azazel” is the name of a demon, why would the Lord send it a goat carrying Israel’s sins? In any case, once the sin offering of the two goats was finished, atonement was made for all of Israel’s sins that year (Lev. 16:34). Romans 8:3 tells us that Christ was sent to be a sin offering. Christ’s sin offering was foreshadowed by the goats offered on the Day of Atonement, and each goat has something to teach us about Christ’s sacrifice. No sins were placed on the goat for the Lord but its blood was shed for the sins of the people. This shows us that “Christ also died for sins once for all, the righteous for the unrighteous, that he might bring us to God” (1 Peter 3:18). Jesus suffered for our impurity though He Himself was without sin (Heb. 4:15). As High Priest, the risen Christ entered God’s presence “once for all by his own blood, thus obtaining eternal redemption” (Heb. 9:12). Christ’s blood completely erased every sin that has been committed, that is being committed now, or that will be committed. The blood of Jesus is so effective that no other sacrifice will ever be needed to cleanse us (Heb. 10:18). These things being true, the writer of Hebrews says something stunning: “since we have confidence to enter the Most Holy Place by the blood of Jesus…let us draw near to God with a sincere heart and with the full assurance faith brings….” (Heb. 10:19-22). Jesus’s blood has eliminated the need for God to separate Himself by veils. Our High Priest’s ministry has opened the way for all of us to enter the Most Holy Place and the presence of God. And we are to do so with confidence and assurance, not cowering and guilt-ridden. Other than confessing sins and believing the blood of Jesus has cleansed them, sin should no longer be a factor in our relationship with God. What can the goat for azazel show us? Hebrews 9:28 says, “Christ was sacrificed once to take away the sins of many people….” While the goat for azazel isn’t specifically mentioned in this verse, we can see it in the fact that Christ bore all sin on Himself and took it away. What of the idea that azazel names an evil spirit in the desert? When Jesus was arrested and His suffering began, He said, “[T]his is your hour—when darkness reigns” (Luke 22:53). Jesus walked the road to the cross alone. His friends betrayed and denied Him. People told lies about Him. He was humiliated, made fun of, beaten, spat on, tortured, and finally murdered with the approval of those who should have promoted justice. Behind this grotesque spectacle, we can see the one who is accuser, murderer, and father of lies, pulling the puppet strings (Rev. 12:10; John 8:44). Carrying all our sins, stumbling under the weight of the cross and wracked with pain, Jesus was sent away from His Father and handed over to the devil. However delighted satan may have been to mock and torture Christ, the cross was his end. First John 3:8 says, “The devil has been sinning from the beginning. The reason the Son of God appeared was to destroy the devil’s work” (1 John 3:8). Sin is the devil’s work. Since he introduced it, the serpent has used sin to dominate and ruin humanity. By sin, satan hoped to turn everyone against God and to wage war on God’s vision of a creation filled with Christ. Without sin, the devil has no weapon, no strategy, no means of attack. By removing sin, Jesus destroyed satan and everything he was working to achieve. The goat for azazel is traditionally called the scapegoat. Enjoyed your sharing as usual. I wanted to offer another comment about how the scapegoat was fulfilled in Christ. Remember how the first goat was put to death and the second was a living offering? Rom. 5:10 says “For if while being enemies we were reconciled to God through the death of His Son, much more, being reconciled, we shall be saved by His Life” LITV. Consider how the first part of High Priests duties in that Day were done on his way to ascend into a cloud: into into what represented heaven. as he ascended, he wore a white garment as he offered the blood. This first half of that day represented our reconciliation through the death of His Son. But after he had covered or atoned the mercy seat with blood, then He offered the scapegoat. It is significant that this is the only living sacrafice in the Law of Moses. It was a very specific promise of Jesus of Nazereth showing Himself to Israel for forty days. (He is also the fulfillment of Nu13-14: when 12 wittnesses spied out the land) So why was the scapegoat sent away? So that He could be put out of view. Yes He had to show Himself in that way because of unbelief. So He could say, “see My hands, and bring your hand and thrust into My side, and be not unbelieving, but believing” But His intention was show Himself in union with the Israel. “even if we have known Christ according to flesh, yet now we no longer know Him so” 2 Cor 5:16. The scapegoat was put out of view so that the people could see another appearing. The the High priest would take off His white garment: representing the only begotten Son who was with the Father in glory from the beginning, He would wash, and put on the garments of beauty and glory: representing the Body of Christ and many sons brought to glory, even Zion the New Jerusalem descending out from heaven in God. In His descending the high priest would Appear to Israel a second time without sin unto their salvation (See Heb. 9:26). This verse is not going to be fulfilled by an external second coming of Christ. This is fulfilled in by the revelation of Christ in each believer as we are made to see Christ our Life with Spiritual understanding. This began in the Apostle Paul and continues today in “those that look for Him” to appear in the Spirit. This was the manner of His ascension. He showed Himself first in the Natural then in the Spiritual. This is the correct order. When the angels asked “Men, Galileans, why do you stand looking up to the heaven? This Jesus, the One being taken from you into the heaven, will come in the way you saw Him going into the heaven.”Acts 1:11. The manner of His Ascension was not flying in sky like Superman. And it was not from Spiritual to Natural. His coming was first in “flesh and blood”, natural, and then in the Spiritual. Amen. Thanks for taking the time to comment! Your thoughts connect many dots through the scripture. Much appreciated!